Sitting in a suit and glasses instead of the green Broward Sheriff's Office uniform he wore for over three decades, the former school resource officer at Marjory Stoneman Douglas High admits he "didn't get it right" on the fateful day when 17 people lost their lives in one of the deadliest school shootings in American history. 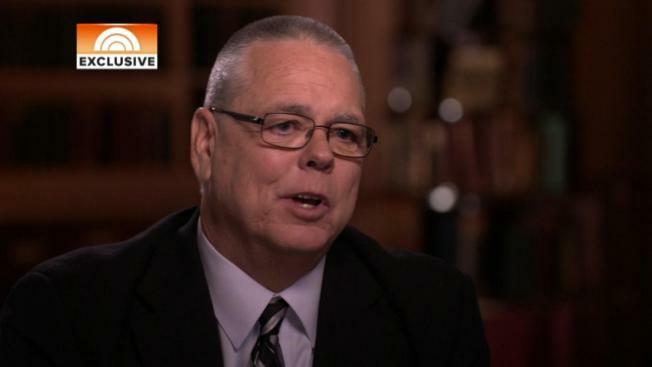 Scot Peterson, who was the deputy at the Parkland, Florida, school for nearly a decade, spoke with NBC News' Savannah Guthrie in his first televised comments since the Feb. 14 shooting. Tearfully saying he was sorry at points, Peterson said that he should have done more after hearing shots fired inside the school's 1200 building shortly after 2 p.m.
"I live with that, how could I not?" Peterson said. "I'm human. In the perfect world, I would have said, 'Oh yeah, I know there is a shooter in there. Let me go to the third floor, find this person.' Knowing what I know today, I would have been in that building in a heartbeat." "I'm never going to get over this. Those are my kids in there," he added. "I never would have sat there and let my kids get slaughtered. Never." Peterson told Guthrie in interviews airing Tuesday and Wednesday that it wasn't true he didn't enter the building because he didn't want to "face somebody in there." Despite having been labeled a "coward" by President Donald Trump, he said instead that there was no time for fear. "I never thought even for a moment of being scared or a coward because I was just doing things the whole time. It just never — it didn't even — it never entered my mind," said Peterson, who retired from the department shortly after the shooting. Surveillance video showed Peterson picked up by a security monitor in a golf cart and later standing outside one of the school's buildings during the shooting, radioing in for additional deputies and officers from other agencies to respond to the school. "As we approach near the building I hear two to three loud shots. I immediately stop and I'm thinking to myself, 'Oh my God, I hear shots outside,'" he said. "I went right to my [police] radio," he said. "I screamed, 'Shots fired.' I then went to the school radio and I said, 'Put the schools in lockdown.' I'm yelling at the security specialist, 'Get out of here. Get out of here.' Because I thought the shots were outside and I didn't want him standing out there." Peterson, who told Guthrie that he was trained to contain the area first, also placed some of the blame on Drew Medina, that monitor who said he saw Nikolas Cruz, the suspected shooter and a former student at the school, get out of an Uber and run toward the building with a bag. Medina later told investigators the same thing in a sworn statement obtained by the South Florida Sun-Sentinel, however, he has since denied those details. The 33-year law enforcement veteran said he was giving his side of the story for the families of those who lost their lives. "They need to know the truth of what I did and not that false narrative that Sheriff Scott Israel gave," he said. Peterson's recent interviews have drawn backlash from those who lost loved ones in the shooting, including Fred Guttenberg, the father of 14-year-old victim Jamie, and the father of 17-year-old victim Joaquin Oliver. "I don't want this person to become a victim," Manuel Oliver said during a press conference in Miami on Tuesday. "I don't think it's fair. I think he failed." "Scot Peterson, you were not a victim and so stop with this crap. You created victims. My daughter was one of them. She was on the 3rd floor and you could have saved her life," Guttenberg posted on Facebook. "You are not making things better with your interviews. They are not 'your kids' as you say. They were our kids and now they are dead because of your failure and incompetence." Peterson is the subject of a wrongful death lawsuit from the family of Meadow Pollack, one of the four seniors who were honored Sunday at the school's graduation ceremony. "He could have stopped it. Could have saved my kid. Nobody should be able to not do their job, receive a pension and ride off into the sunset," Pollack's father Andrew told The Associated Press. Peterson has been receiving over $8,700 a month in pension from the state following his retirement. Florida Department of Management Services said in an emailed statement to NBC Miami that because there were no charges filed against the 55-year-old Peterson, there was no reason to deny him his benefits per Florida law.